Don't forget to subscribe to our mailing list to receive notifications for new content and other cool things! The Battle of Armageddon – Past or Future? Revelation 16:16 (KJV) – And he gathered them together into a place called in the Hebrew tongue Armageddon. Sell Books – Write About “Armageddon”! I did a quick search on the Amazon.com website for books and videos containing the word Armageddon. The search yielded 293 hits! The subject of Armageddon certainly is popular today. You can be sure that any book or movie containing the word Armageddon will certainly grab the attention of an unsuspecting public. One of the most misunderstood scriptures in our Bible centers around Revelation 21:21. This is the “pearly gates”, “street of gold” scripture. Should we take this scripture literally? Let’s explore what the scriptures reveal. Revelation is undoubtedly a unique book. While considered part of the New Testament, it is different from other books of the New Testament. More importantly, it is different from styles of writing used today. Revelation is apocalyptic. The word ‘revelation’ in Greek is “apokalupsis”, which means ‘an uncovering’ or ‘unveiling.’ Thus, Revelation is a book that was intended to reveal, not conceal! The book is an example of apocalyptic literature. Apocalyptic literature is a literary style popular from 200 B.C. to 200 A.D. It is a style known for highly symbolic or figurative language written during times of persecution. It usually depicts the conflict between good and evil while encouraging the righteous to persevere. I’ve always had a fascination with the last book of the Bible, Revelation. Fascination mixed with a certain amount of fear and curiosity. My mind raced ahead to thoughts of therm-nuclear war, computer chips and the end of the world as we know it. The book of Revelation, more than any other New Testament book, has been used to support any number of “end of the world” scenarios. Many view Revelation chapters 4 thru 20 as unfulfilled. Revelation is used to support beliefs found nowhere else in Scripture. For example, the one thousand years or millennium reign of Christ is mentioned only in Revelation 20:1-6. Also, those who hold the belief in separate resurrections turn to Revelation 20:1-6 as their proof texts. Revelation is undoubtedly a unique book. While considered part of the New Testament, it is different from other books of the New Testament. More importantly it is different from styles of writing used today. Are We in the Laodicean Church Age? For many years, I believed and taught that the seven churches mentioned in the second and third chapters of Revelation were sort of time clock of the church age in progress. I believed that God purposely selected them for a definite and distinct purpose: to give a complete picture of church history from the beginning to end. The last church the Lord Jesus Christ addressed was the church at Laodicea. The Laodicean church was the “lukewarm” church. Revelation 3:15 says it this way: “I know thy works, that thou art neither cold nor hot”. This teaching regarding the “church ages” is part of dispensationalism. Dispensationalism is a Christian, Biblical interpretation that believes that God has related to human beings in different ways under different Biblical covenants in a series of “dispensations,” or periods in history. As a system, dispensationalism is expounded in the writings of John Nelson Darby (1800–82) and the Plymouth Brethren movement and propagated through works such as Cyrus Scofield’s Reference Bible. A close friend of mine asked me to consider what Revelation 10:6 means in regards to the statement that “there should be time no longer”. Her thinking was that this verse is prophesying that in our future, we will get to the end of time. Time would cease to exist. The implication was that this earthly realm and our existence would end. My response to her was “Let me study the scriptures”. Amplified Bible (AMP): Revelation 10:6 – “And swore in the name of (by) Him Who lives forever and ever, Who created the heavens (sky) and all they contain, and the earth and all that it contains, and the sea and all that it contains. There’s been much speculation on the meaning of Revelation chapter 13. Many teach that this scripture refers to a cashless society where all will be required to submit to a computer chip implanted under the skin of the forehead or right hand. (Why not the left hand?) And, of course, the technology for this cashless society is already here. But the question is not whether we might soon have a computer chip implanted in our flesh but whether or not Revelation chapter 13 prophesied this. Within the last thirty plus years, there have been many books written by the Christian book publishing industry. Blood Moons – Apocalypse Now? The subject of “blood moons” has certainly been in the news lately. 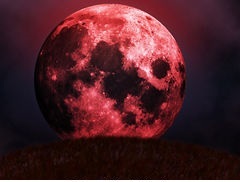 Many well-known ministers have gone on record with predictions related to the four “blood moons”. Books have been recently published on the subject. In fact a movie has even been made. Most proponents of the “blood moon” lunar eclipses claim that the four blood moons that have appeared and will soon appear in the skies over America are evidence of a future “world-shaking event.” Some tie these lunar “tetrad” events to biblical prophecies found in Ezekiel chapter 38. Some declare that Russia and Iran will be totally destroyed during this coming Ezekiel 38 battle. The blood moons are part of a tetrad, a set of complete and consecutive lunar eclipses that will begin on April 15 and continue at roughly six-month intervals until October 2015. According to NASA, seeing four complete lunar eclipses in a row is very rare. My first encounter with the book of Revelation was fear mixed with intense curiosity. You will be shocked to learn that there is no mention of the phrase “The Antichrist” in the entire Bible. By that, I mean that you won’t find the term “The Antichrist” anywhere in the King James Version of the Bible. In fact, there are only four verses in the King James Bible that speak of “Antichrist.” There are three references in I John chapter 2 and one verse in II John chapter 2. The words “antichrist” and “antichrists” are only found five times in the King James Bible. The online home of Scripture Revealed, join us as we walk through the Holy Bible together. We hope our thoughts on God's word can aid you in your journey through life. World Without End – Amen! Holy Cow, another Red Calf! Ron on Perilous Times Shall Come! Emeka Njoku on Perilous Times Shall Come!